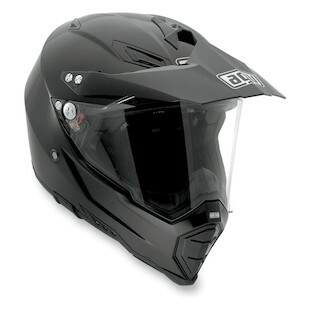 Dual sport helmets, enduros or hybrids are the succession of the dirt helmet, originally invented by Arai with the XD-3. They are designed for riding at high speeds on highways but also perform well off-road. The trade-offs are a larger profile and noise level, but have the advantages of great air flow and can be worn with goggles. 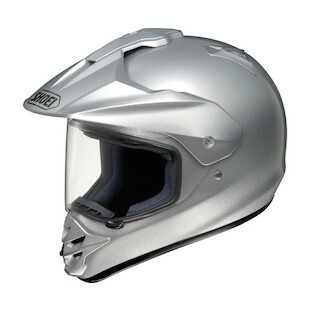 There are three ranges of pricing, the lowest and best helmet for under $200 is the AFX FX-39 Dual Sport Helmet. An aerodynamic poly carbonate shell design in an intermediate oval shape, the face shield was redesigned and flattened out for better vision. Goggles can be worn while still using the faceshield in its down position. The fully removable and washable liner and cheek pads are made of hypoallergenic and anti-microbial nylon. Retention system is quick release with sewn on ECE logo, Dot approved. Moving into the mid-range price range, the AGV AX-8 DS EVO helmet is lightweight with its composite shell: carbon fiber, Kevlar and fiberglass. With an evolved chin spoiler area that absorbs shock, there's a reduced risk of chest trauma. The chin vent area has a new shape with increased rubber. The visor is scratch proof and has anti-fog and distortion free properties. 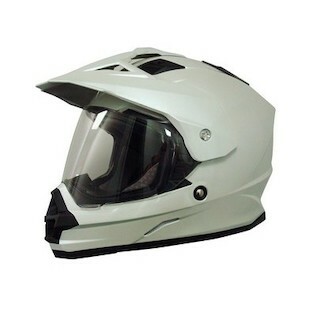 The helmet vents well, has a removable breath guard, washable cheekpads and lining. DOT and ECE 22.05 certified. In the mid-range price range, the Icon Variant Helmet is executed in a fiberglass, Dyneema and carbon fiber with a dual-density EPS core. A wind tunnel refined shape provides extensive venting and a removable and washable wicking liner. The anti-lift visor has an extended eyeport and zero distortion optics. Peak is non removable and exceptionally aerodynamic. This helmet is ECE, DOT, SAI and SG certified. 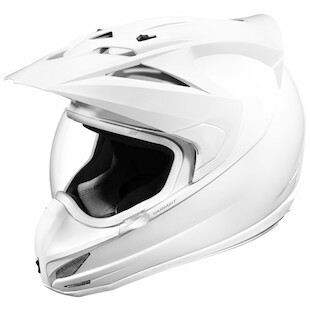 In the upper crust of dual sport helmets the Shoei Hornet DS offers premium features and functionality. It's composite outer shell is rigid, lightweight and resilient. With a medium oval shape, the face shield is wide with a 3D curve that seals against eyeport beading. A shutter behind the nose cover directs air flow to clear shield fogging. A fully removable interior with 5-layer cheekpads that are channeled for eyeglasses. DOT and Snell approved. 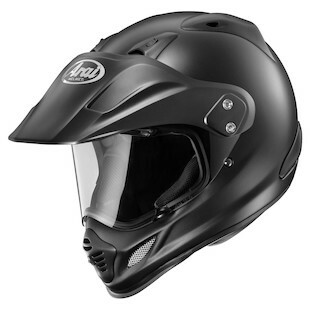 The high end Arai XD-4 helmet implements improvements over the XD-3 dual sport, already leading the pack in this category. Notable improvements are increased ventilation with redesigned face vents, a venturi vent at the brow and larger sculpted side cowl vents. The dry-Cool interior is fully removable with micro fitting 5mm peel away temple pads. A new shell shape creates better aerodynamics and stability at higher street speeds. Snell approved.